the fash pack: attention, cebu and davao fashion designers! PROJECT RUNWAY PHILIPPINES FLIES TO CEBU and DAVAO! 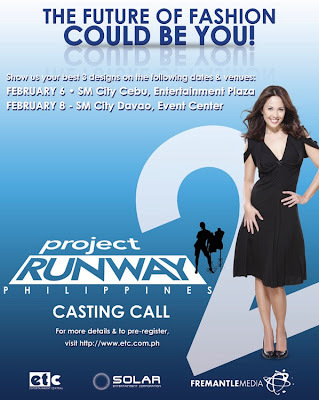 Get ready to be part of Project Runway Philippines history. Pre-register by sending your resume and some sample images of your designs in jpeg format to: etc@solar-entertainment.com starting today until February 5, 2009. The future of fashion could be YOU. Don’t forget to check the website regularly for updates on casting calls!